I live in far western Canada, and am related to a good many of the Old Ilkeston families through both grandparents born there, with surnames in their trees including: Beardsley, Beaumont, Birch, Goddard, Brown, Skeavington, Wagstaff, Shardlowe, Daykin, Rawdin, Gregory, Burgin-Richardson, etc. etc. ; some of these relations are on both my grandparents’ trees! My question regards photos … photos … if I were to send a couple photos are you able to post them? I’d be interested in seeing others’ old family photographs as well if provided to view. 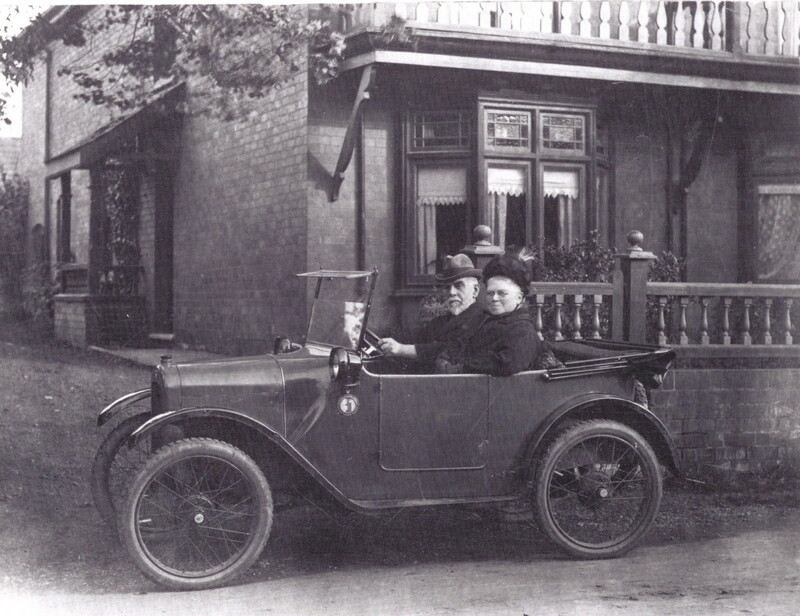 I have one of my great-grandparents Amos and Sarah (nee Birch) Beardsley sitting in front of their house on (South Street) in one of the first Austin 7’s! So nice to hear from you, What a wealth of good old solid Ilkestonians you are connected to !! re the photos .. I would certainly wholeheartedly welcome any photos, illustrations, pictures, etc from any source (being wary of copyright of course). The one of Amos and Sarah sounds fascinating and if you send it to me I will do my best. Thank you so much for this offer. I calculate the year would be 1923 as Amos and Sarah married 20 October 1863 at Christ Church, Cotmanhay. As mentioned, I believe this photo was taken outside their home on South Street. Perhaps the home is still there? Amos was son of Jonathon Beardsley/Catherine nee Skeavington. His elder brother was Solomon, whose photo is in one of the articles. 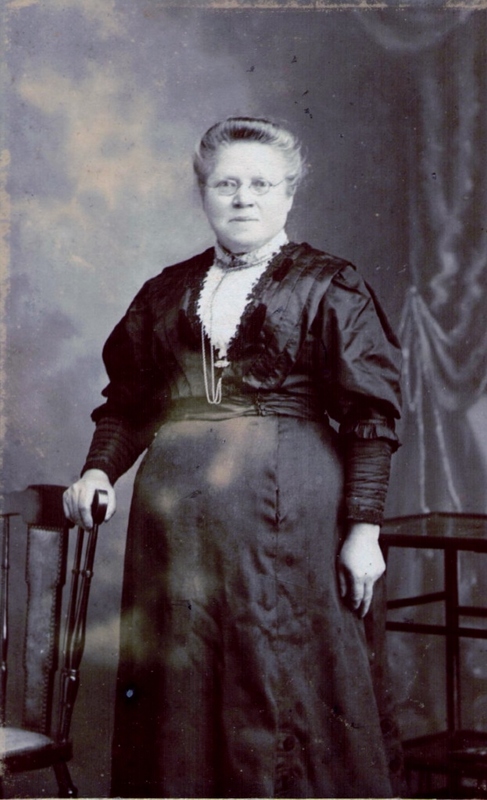 Sarah nee Birch was daughter of John Birch and Sarah Wagstaff. One of Sarah’s sisters was Mary, married to Thomas Ebbern. Amos and Sarah are my great-grandparents; their son Amos (Jr.) and his wife Maud Gertrude nee Beaumont are my mother’s parents. I’ll follow with individual photos of Amos and Sarah also. Mary Ebbern nee Birch, sister of Sarah, was born April 6th, exactly 100 years to my birthdate! I was given one of her dresses by the caregiver of my twin cousins (now deceased), May and Elsie Paling (lived on Green Street). Their mother was Annie Paling, a daughter of Thomas and Mary Ebbern.Also inherited from May and Elsie a “musical photo album”, full of photos of Ilkestonians I don’t know but are probably May and Elsie’s Ebbern relations. One day I’ll have to try and scan them as full pages (as they can’t be removed from the album), and maybe their descendants may recognize them. Down the road I’ll perhaps give the album to the Erewash Museum. (your) latest project concerning photos and information on Stanton Road cemetery … the last entry dated 26th March has me confused. It concerns the gravestone of the children of Amos and Sarah Beardsley (nee Birch) and the first child buried – John Albert 1864. According to the burial records listed previously on your site commencing 1864 there is no mention of John Albert, but seven more Beardsley children from 1868 to 1880. Is this initial burial entry in 1864 missing from the records?? (re) the ‘missing’ burial of John Albert 1864, two possibilities spring to my mind ..
a) the infant was buried elsewhere, possibly at St Mary’s or at Kirk Hallam, though I don’t have the full burial records of either of these places to confirm or deny this possibility. b) he was buried at Stanton Road but the burial is missing from the records. This would be an error on the part of those keeping the accounts …. as you can see all the burials were numbered and there is no break in the numbers for 1864. The actual gravestone was most probably made after the deaths of all the children listed on it .. ie post 1878. It is more of a remembrance stone and so wouldn’t necessarily mark the site of John Albert’s resting place. I have a Beardsley family who don’t seem to be in your census list for 1841 and 1851. Does your website cover Ockbrook? 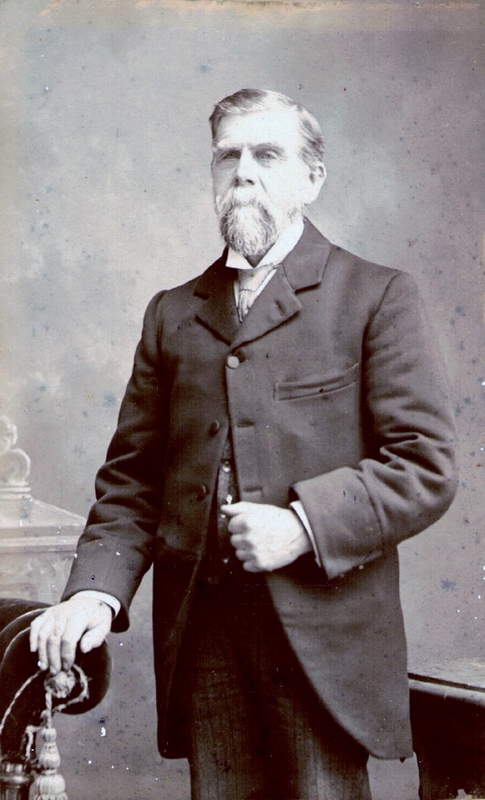 Isaac Beardsley was born in Kirk Hallam around 1792 and married Mary Dowman in Ockbrook in 1823. He was a frame smith for most of his life, then became a beer retailer. They lived in Ockbrook and had children Thomas, Ann, Harriet, John, Elizabeth, Caroline, Edward up to1841, then Hannah and Jane. I am trying to find Isaac’s parents from Kirk Hallam. Isaac died in Ockbrook in 1864. I am overseas so haven’t been able to visit these places yet and others have told me that some of the parish baptism records are not yet on line. The site tries to concentrate upon Ilkeston, though we have wandered to other neighbouring places occasionally. Ockbrook doesn’t often feature. I am sure you realise that Isaac Beardsley and his family were living at Ockbrook on the 1841,1851 and 1861 censuses. As you point out, he appears to have been born at Kirk Hallam about 1792. In the baptisms records of Kirk Hallam Church there is no entry for Isaac at any time, though there are quite a few Beardsley family records for around the second half on the eighteenth century and into the next century. Had he been baptised it may have occurred in a nearby village/town … Mapperley, West Hallam, Stanton by Dale, Shipley/Heanor ? I will post your query on the site to see if anyone else has any ideas.